Security and safety is prime concern both at your residential and work place and who does not want to live a carefree life. We all want our place to be safe even when we are away and one of the best solutions for high end security is installation of surveillance system and cameras with 24×7 recording. It is important to choose a security camera which is long lasting, efficient and reliable. With the Zmodo 1080p HDMI NVR Security Camera System, you can take care of your place with utmost security. The surveillance camera from Zmodo ensures intelligent recording with integration of the advanced NVR technology. 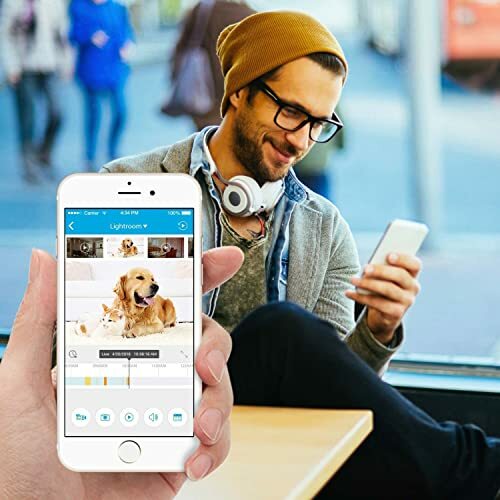 The latest technology ensures storage space optimization allowing recording for longer time. Using the technology, the recordings can be synced and played on your mobile phone. With the help of advanced technology, it records at fewer frames per second during no motion and during motion; it records at maximum frames per second. The cameras are perfect for installation both outdoors and indoors and have wide angle coverage. The security system is reliable and efficient enough to cover wide area and ensure that your place of surveillance is safe and secured. It provides 81 degree angle of view. If the recording and picture quality is not crisp and crystal clear, it is not worth the money and purchase. The security system is backed with High definition lens with 1080p that ensures crystal clear recordings. The camera is able to record the best visuals even when the weather condition is not right and seen in HD quality. The inclusion of the NVR technology ensures perfect options for recording with 100fps record rate along with support for various record modes like motion activated recording, intelligent recording, normal recording etc. The recording system also ensures fast forward, slow play, digital zoon along with video resolution of 720p HD. The best security provided by the surveillance system is making itself available to be synced with external device. It can be synced with smartphone, iPad, PC etc. after setting up of the camera and the recorded videos can be viewed remotely in real time using the external devices. The security and surveillance ensures complete safety and make sure you are aware of everything happening around. The system has ability to push notification to your phone alerting you of any suspicious motions it detects. The settings can be customized by you and the time schedule for receiving the alerts can be set by you. The system in short will send you alerts when you want. The system protects high level of security and understands that it is not possible for you to keep a check all the time. The system once set up, can be synced and shared with all the family members. 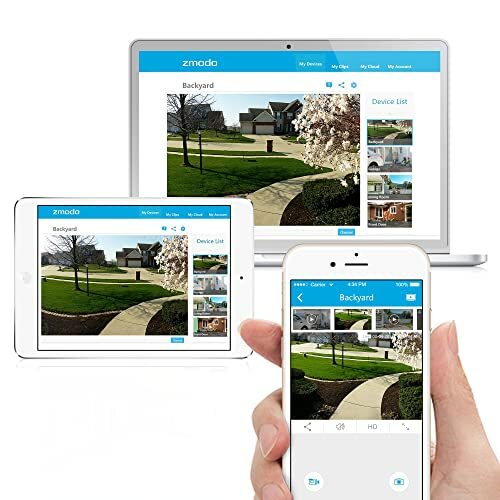 This enables viewing of the account simultaneously by different family members and is convenient to keep a check on the home or commercial place. The cameras are perfect for surveillance both during day and night time. It is equipped with infrared night vision which enables clear recording of the video and images even during dark and night time. Even during night, it enables recording of HD videos. It is a very important aspect while choosing security and surveillance camera because it needs to be safeguarded in extreme weather conditions when installed outdoor. The material for manufacturing the camera should be strong and durable for making it of long term use. The Zmodo surveillance system is able to resist harsh weather conditions and give great performance. 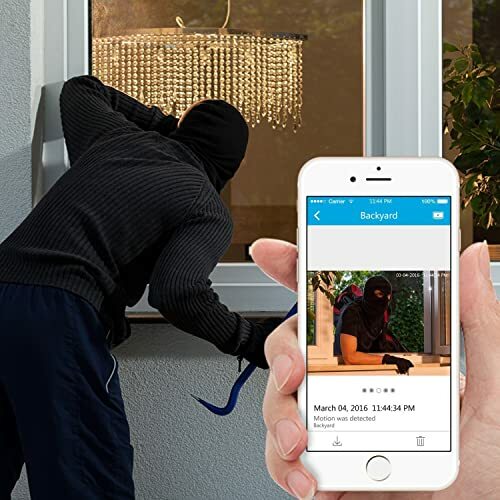 The connectivity feature of the surveillance system is great and is able to connect to iOS7 and above and Android 4.0 and above phones, tablets and laptops. It also supports Wi-Fi connectivity of 2.4GHz for better access. It comes with pre-loaded 500GB HDD as memory and ensures efficient and optimized recording. The recordings for the last twenty days are recorded in the HDD and can be viewed anytime. The HDD holds the recordings from all the eight cameras from past twenty days. The dimension of the product is 14 x 11 x 11 inches in terms of length, breath and height respectively of the product. The shipping weight of the product is 7.8 pounds making it light weight and easy. It provides an image quality of 1080p in HDMI. The product is great for security and surveillance which includes 8 pieces of camera with 1 Megapixel. It is completely worth the price based on the features it has and the impactful security it provides to home and commercial spaces. There are many good features in the product that makes it incredible but we cannot ignore the cons completely. Ease of use and installation enabling one step set-up. Powerful IR sensors enabling 65ft night vision for crisp and clear images. One of the best features is tracking of motion and sending alert notification to phones. Any motion detected and unexpected movement is notified on your smart phone. Effortless connectivity with phones and tablets for real time sensing and view. Pre-installed HDD memory of 500GB ensures all time crisp and clear recordings. NVR technology incorporates wide range of recording options and facilities. It optimizes the recording based on the motion and takes the frames per second accordingly. Resistant to harsh weather conditions and perfect for use in both indoor and outdoor conditions. One of the biggest cons of the product is it does not provide 360 degree wide angle movement and is limited to 81 degrees. Apps used for increasing productivity are compatible but at times syncing issue may appear. The connectivity is limited to certain versions of iOS and Android OS. Level of assistance and user installation guidance was found poor by many users. 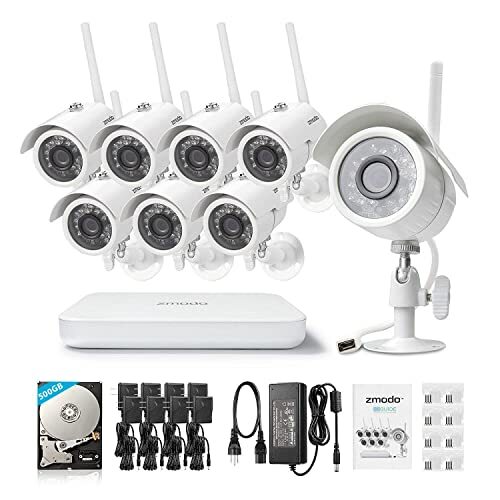 Overall, the 8 pieces of 1 Megapixel camera surveillance and security system is good and provides great security to your home or commercial place. 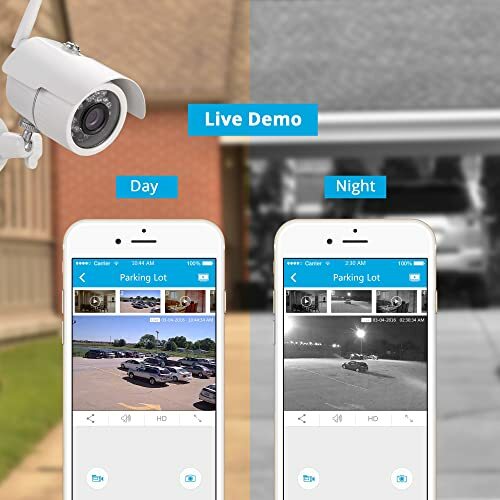 The Zmodo 1080p HDMI NVR Security Camera System has many users and is one of the best choices to make for ensuring reliable surveillance and security. Very helpful reviews. Thanks very much. Will try one Zmodo for sure.